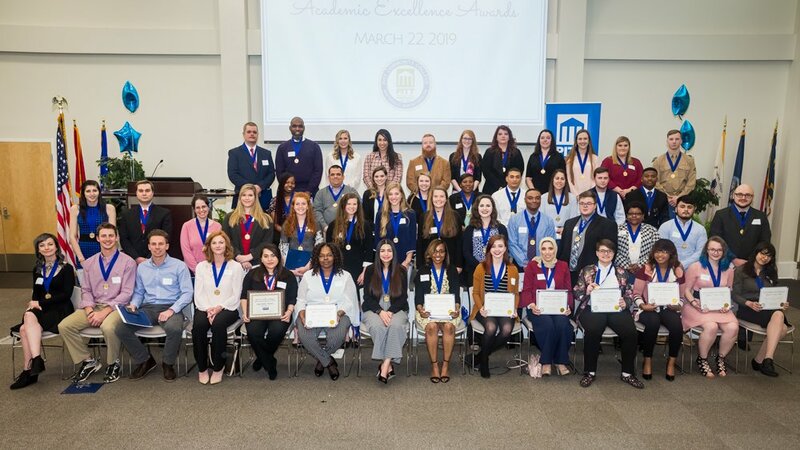 WINTERVILLE—Pitt Community College honored 54 of its best and brightest students this month, during the 2019 Academic Excellence Awards ceremony. The program, which took place March 22, is held each spring to recognize students for classroom, campus and community achievements. It featured remarks from PCC President Lawrence Rouse, who said the honorees have set a higher bar for measuring their success. “I commend all award recipients for your hard work and dedication to achieve a higher level of excellence,” he said. All of the award recipients were nominated by PCC faculty and staff and given special medallions crafted by the college’s Machining Technology students to commemorate their achievement. In addition to the medallion presentation, the ceremony included a speech by Academic Excellence Award recipient Sindy Martinez, who explained what PCC means to her as a Paralegal Technology student. A native of El Salvador, Martinez came to the United States with her family at age four. She became a victim of domestic violence soon after and recalls that when she was just eight years old, she helped her mother fight off her drunken father after he’d fired a gun inside their home. For at least a year after the incident, Martinez was on the move with her mother and sister to elude her father. The three eventually found a measure of normalcy, and Sindy enrolled at North Pitt High School. During her freshman year, she became pregnant, so instead of focusing on a driver’s license at 16, she had a son who would become her motivation to succeed. Martinez, who was PCC’s selection to receive a State Academic Excellence Award from the N.C. Community College System (NCCCS), has excelled as a Pitt student and is on track to graduate next spring. She has a 4.0 GPA and is a member of the PCC Paralegal Association, N.C. Bar Association and LEX National Paralegal Honor Society. She also volunteers with the Salvation Army and Food Bank of Eastern & Central North Carolina. This year’s program also featured several special award presentations by the PCC Foundation. Welding student Brandan Acevedo received the 2019 President’s Scholarship worth $500 toward his tuition and fees. Acevedo, who has a 4.0 GPA, works full-time with a welding company and volunteers at church events and as a trash collector. Jacob White, an Associate in Arts student with a 4.0 GPA, received the President’s Award worth $500 for outstanding academics, leadership, volunteerism and service to the college. White is a Phi Theta Kappa International Honor Society member and vice president of PCC’s Gamma Beta Phi National Honor Society and Phi Beta Lambda student clubs. He is also a member of the college’s Answering the Call Christian Club and a local food bank volunteer. Division Awards were presented to students Dontrell Jones (Arts and Sciences), Sharon Moore (Business), Chelsea Biondi (Construction and Industrial Technology), Macy Powers (Health Sciences) and Entisar Abulebdeh (Public Services and Fine Arts). Each student received $250 through the award. Awards were also given to several students for excellence in developmental studies courses. The recipients were Ebonie Howard, Pedro Jackson and Jones. Howard and Jackson received $125 each for their awards while Jones received $250, since he also earned an Academic Excellence Award. Softball’s Kelsey Peedin and baseball’s Austin Lafollette—both University Transfer students—received Student-Athlete Awards worth $250 in recognition of their classroom success, and Markus McCraney, an Entrepreneurship and Associate in Arts student, was named PCC’s nominee for NCCCS’s Gov. Robert W. Scott Student Leadership Award. A veteran, McCraney has a 4.0 GPA and is the president of Phi Beta Lambda. Max Hamilton, an Advertising & Graphic Design major with a 3.94 GPA, was announced as the college’s nominee for the Dallas Herring Achievement Award from NCCCS. Hamilton recently submitted the winning logo design for the 2019 Community College High-Altitude Ballooning Team Challenge and Competition.